PULLMAN – Throughout Washington State’s prolonged slump, Ernie Kent has begged and pleaded for a tougher, more resilient group of Cougars. 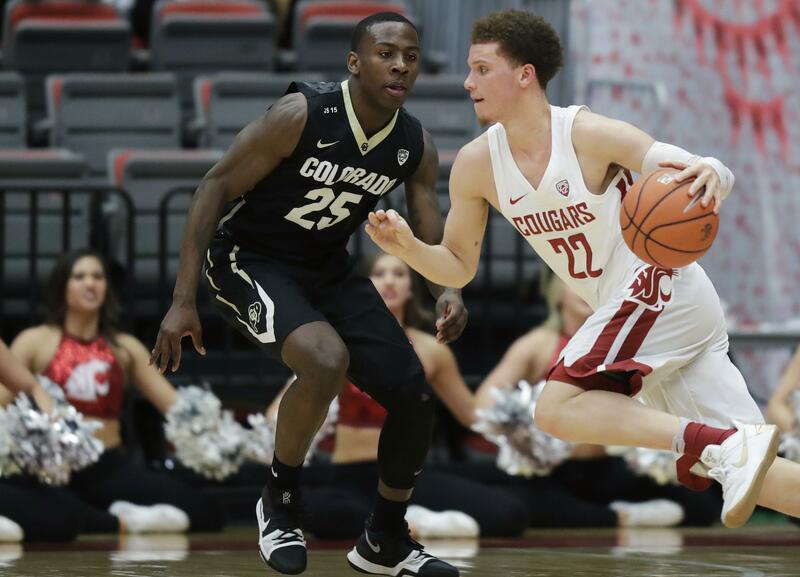 The Cougars finally delivered on their coach’s wish, fighting, scrapping and clawing their way to the finish line in a 73-69 win over the Colorado Buffaloes Thursday night at Beasley Coliseum. The victory breaks a seven-game skid and pushes the Cougars into 11th place in the conference standings. WSU had previously lost 15 of its last 18 games – including the last two by a whopping 59 points – but demonstrated urgency and maturity Kent hadn’t seen since the Cougars made their run through the Wooden Legacy tournament. Malachi Flynn scored a career-high 30 points on 11-of-19 shooting from the field and 3-of-8 from distance. For a majority of the game, the sophomore point guard was the only offensive bright spot for the Cougars, who lost Davante Cooper to foul trouble with about 11 minutes to go after the junior forward started the game an efficient 4-of-5 from the field with eight points. Flynn closed strong, jamming 21 of his 30 points into the second half and 16 of those into the final 10 minutes. WSU trailed by as many as eight points in the second half, but the Cougars surged ahead in the closing minutes when Viont’e Daniels canned a 3-pointer to make it 63-62. The Buffaloes grabbed a 69-68 lead with 51 seconds left, but Robert Franks, on a slow scoring night by his lofty standards, came up with a crucial defensive play when he picked off Dom Collier’s pass on CU’s final possession. Franks drained two free throws on the other end to seal the victory. He shot just 4-of-12 from the field and 1-of-6 from three-point range, but Franks, who missed Sunday’s game against Oregon with a knee injury, still found his way to 14 points and chipped in three assists, two steals and two blocked shots. CU lost – and dropped to 1-8 away from home – despite getting 35 tries at the foul line. The Buffaloes made 26 of those, but clanked a few key free throws in the final minutes. WSU was far from perfect from the charity stripe, making just 16-of-23 free throws, and the conference’s top three-point shooting team managed just 7-of-29 from beyond the arc. For a stretch of the second half, it looked like the Cougars would be doomed by the 24 fouls they wound up committing. Those amounted to plenty of free CU points and disrupted WSU’s pace and flow on the offensive end of the floor. McKinley Wright and Dallas Walton each had 16 points for the Buffaloes. Wright also added seven rebounds and six assists. The victory vaults the Cougars (10-15, 2-11) to 11th place in the Pac-12 standings. Cal also possesses a 2-11 record, but the Golden Bears represent WSU’s only other conference, therefore giving the Cougars the head-to-head tiebreaker. Published: Feb. 15, 2018, 11:11 p.m. Updated: Feb. 15, 2018, 11:12 p.m.